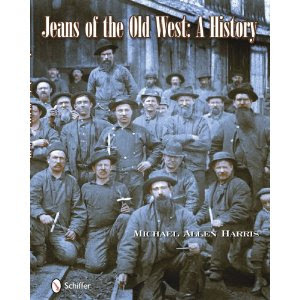 A First Look at "Jeans of the Old West: A History"
With "Jeans of the Old West: A History" author Michael Allen Harris delivers one of the most important works of literature related to jeans. The book's subject—denim garments and their manufacturers in late-1800's San Francisco—is specific at the risk of being esoteric but provides important insights in such an engaging manner that everyone from designers and collectors to fashion students and casual consumers will find much relevance. Anyone particularly interested in the lost history of workwear before the turn of the 20th century will jump for joy poring over the ample pictures and deductive reasoning Harris presents about forgotten manufacturers and their patents to innovate how jeans are made stronger and better. Given the amount of history destroyed in the fires following the major 1906 San Francisco earthquake it is a wonder Harris was able to paint these vivid portraits of the Neustadter Brothers, A.B. Elfelt & Co., Greenebaum Brothers, Heynemann & Co., and other important figures and concerns. In fact this is the primary challenge Levi Strauss & Co. will always face in building their company archive—too many records and properties were destroyed in those fires. It is no surprise that Harris traces the long series of overalls innovations with Levi Strauss & Co.'s riveted pants patent as a starting point. After all it seems that it was Jacob Davis's 1873 patent, filed using Levi Strauss money, that sparked the subsequent patents for overalls improvements which did not infringe on the Levi's patent by other tailors and manufacturers that are so much the focus of this book. To supplement the countless hours of research are pictures (I stopped counting after 250) of antique garments that testify to the patents' practicalities. The best way to describe their condition is in Harris' own words in the book's foreward. He writes, "Considering the limited production runs for some of these jeans, and the difficult conditions under which they were used, the fact that any examples remain is a testament to the quality of their design and construction." That is these garment-remains currently in the collections of Harris and other collectors like Hitoshi Yamada, Mike Hodis, and Brit Eaton, were once the trusted, hard-worked tools of laborers in mines, mills and fields. Through the study of these artifacts new knowledge is brought to light that will certainly tickle those interested in vintage denim. For example hidden at the end of the book is a tidbit that explains why sometimes old jeans found near mines or mills have one or two legs cut off. "I have seen tar-soaked blue jean scraps wrapped around air pipes at old mills. I surmise that this is why some of the old, discarded jeans I have seen had their legs cut off." He provides pictures of such uses and you will see how naturally-suited a pant leg is for this job. And did you know in 1879 Levi Strauss & Co. offered waistoverall workpants in brown, mode and deadgrass colors? Sprinkled throughout are evidence that may dispell long-held beliefs in the collecting world. His cinchstrap theory used to date early Levi Strauss & Co. jeans alone is a breakthrough that will certainly be heavily discussed. Yet through all the deductions Harris keeps a modest and honest tone that is perfectly suited for the topic of old jeans and by this characteristic provides an engaging and enjoyable read. And so for a job well done Michael Harris wins the praise of this blog and surely many other denimheads for delivering a book that does not disappoint despite much anticipation. You can purchase "Jeans of the Old West: A History" directly from the publisher Schiffer or on Amazon.com.